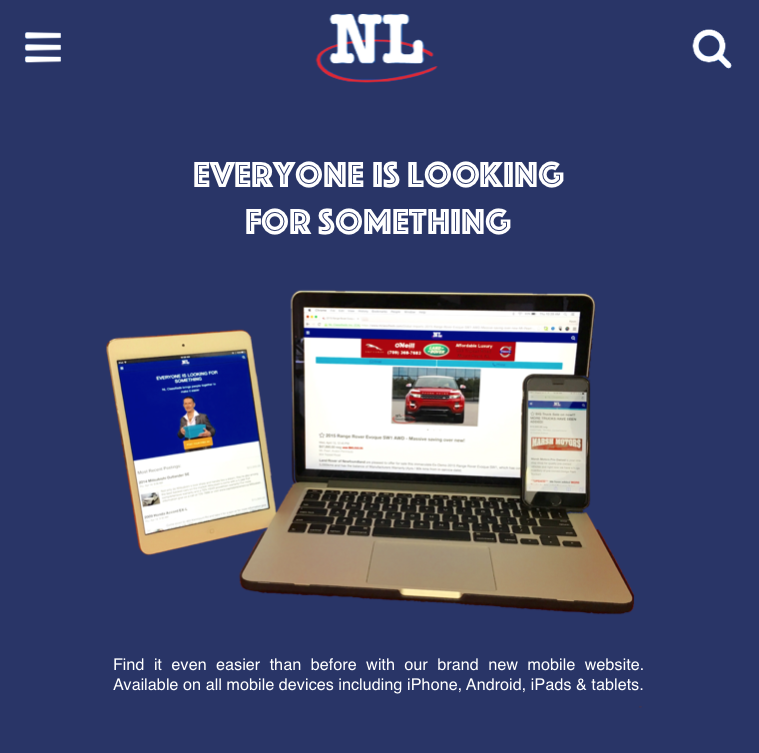 NL Classifieds: Welcome to the NL Classifieds Mobile Website! Welcome to NL Classifieds' brand new mobile website. You'll notice right away that the homepage is fairly different - this is all done to optimize the screen size on a smartphone or tablet - which is much smaller than a desktop or laptop computer screen. The mobile site fits these screens perfectly and also has larger font than the full desktop site (which can still be accessed at anytime from your smartphones or tablets - more details on this further down) did on these devices before. No more zooming in to see what's on the page! The first thing on the mobile homepage is a button to post your ads - we know how important this is so we wanted it to be the most accessible thing as soon as you get to the mobile homepage. 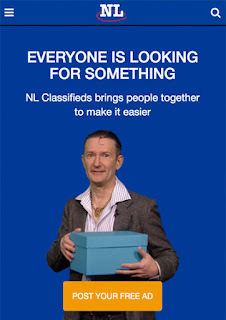 Scroll down and you will see the latest listings, a mainstay on the NL Classifieds homepage for years now. Menu/Categories: Where are all the categories we're so used to seeing on the left side of the page? They are all still there, but with much less space on the screen, we've developed a great new and faster menu. Click the 3 white lines in the top left hand corner - out pops the full menu with all our classifieds categories, login/logout, home, search, contact us and more! The menu shows all top level categories (automotive, recreation vehicles, real estate, etc.) and the number of ads in that category. To see the subcategories, click the category and the menu will show you all next level categories. For example if you click 'automotive' the menu will show all the 'automotive' subcategories including 'cars', 'trucks', 'tires & rims', and more. To see all ads in 'automotive', click automotive on the darker line (this has replaced the "view all" button for a category). The menu is scrollable as well, which means it will move so you can select any one of the categories. 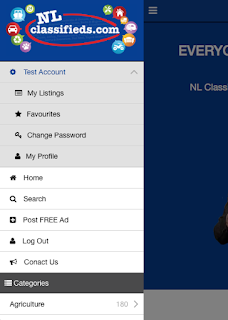 Tip - The NL Classifieds logo at the top of the menu in the image to the left is also a home button. 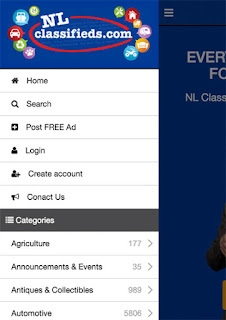 The NL Classifieds logo in the top centre of the picture above is also a home button. These can be used at anytime from anywhere on the mobile site to take you back to the homepage and see the latest listings. The menu will close once you select a category to view. If you would like to close the menu without selecting a category, click on the space outside of the menu (the darker, shaded bit that slid to the right when the menu opened). 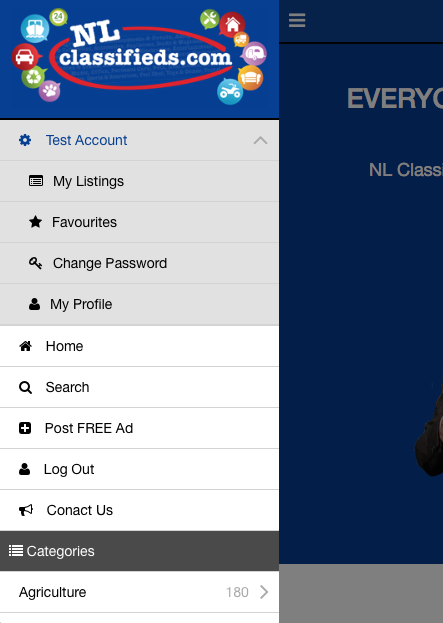 Login: To login to your NL Classifieds account, click the Login button in the menu. 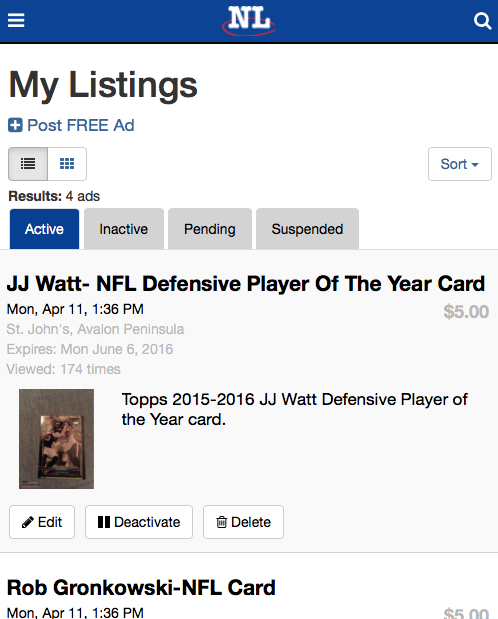 When successfully logged in, you will be taken directly to 'My Listings' where you can see all of your active ads. There is a 'Post FREE Ad' button on this page so you can get your new ads on as fast as possible. My Account: Once you are logged in, the menu will change as well. The new menu will have an extra button, which is where you can always access your profile, favourites, my listings, change password and more. A very popular feature of the full desktop site is 'Favourites', this has been improved for the mobile site and is always accessible from within the menu no matter where you may be on the mobile site. To add or remove an ad from your favourites, you can now click the star on the ad. When an ad IS one of your favourites, it will be yellow. When an ad IS NOT one of your favourites, it will be empty and white. You can have an unlimited amount of favourites so you can keep track of all those items on your wish-list! Search: We know how important being able to search and comb through thousands of ads is - so we made it even better! 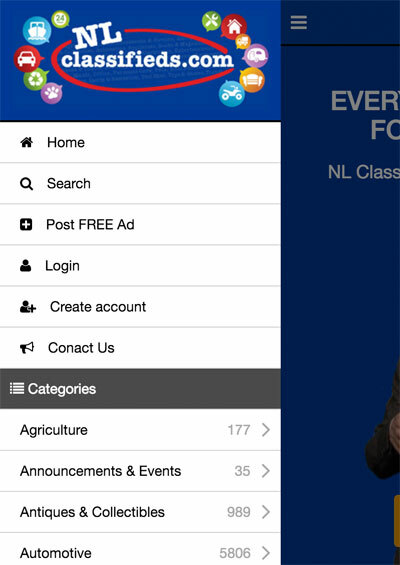 To search NL Classifieds on the mobile website at anytime, click the magnifying glass in the top right hand corner. This will open a drop-down menu where you can type and search for keywords. You can see and use the magnifying glass in all the images of this post at the top right hand corner - this will always be here so you can start a new search from any page at anytime. For an even more powerful search, click 'refine'. 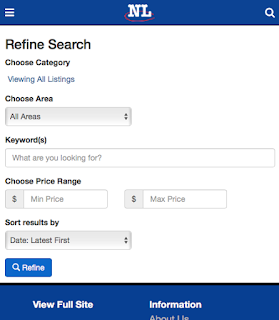 From here you can base your search on category, area, keywords, price range and also sort your results before they even load! 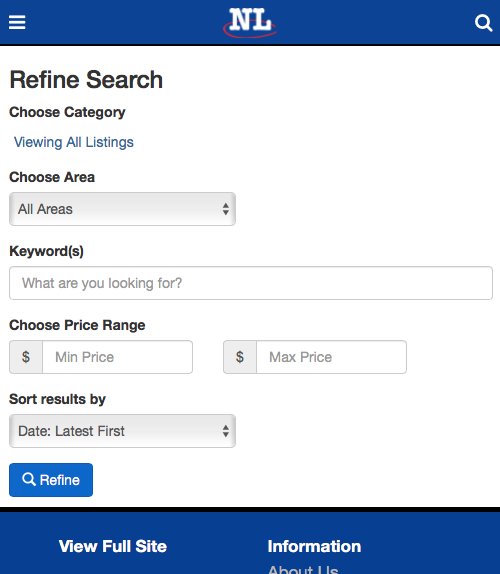 The refine search page will help you find exactly what you're looking for faster than ever before! Ads/Listings: We have also updated the look and feel of the ads themselves. You will now have bigger and easier buttons to call and/or email a poster right at the top of your screen. We have made images larger and scrollable by the touch of a finger. A star will be to the left of every ad title (if the star is empty/white it is not in your favourites - if the star is filled/yellow it is in your favourites) where you can add or remove it from your favourites list. 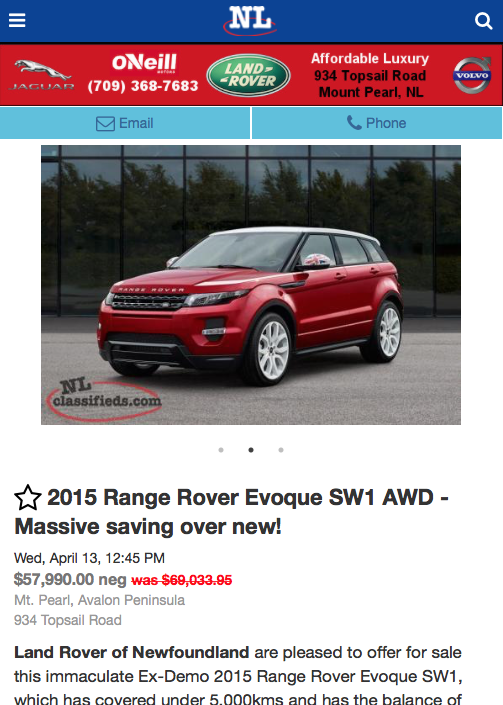 The posted date, price, location and address are also listed right below the ad title. Scroll to see the full description of the ad if you cannot see it all. If the ad has any pictures attached, they will appear at the top of the ad as they do in the example to the left. If there are multiple pictures you will see grey & black circles below the picture. To see the other pictures in the ad, swipe left or right on the picture OR click the grey & black circles to navigate between pictures. Below the ad description you will see other ads related to the ad you are into or other ads from the same poster/seller. Below related/other ads you will see the footer, which is at the bottom of every page on the mobile website. This is where you can find the FAQ, advertise with us, about us & contact us pages. View Full Site: If you are more comfortable with the full desktop website or would like to switch back and compare the full site with the mobile site, the button to do so is at the top of the footer. Click "View Full Site" to switch back to the full desktop site, which has not changed. If you make this switch and then want to switch back to the mobile website, the button to do so will be in the same place on the full desktop site (at the top of the footer). We hope you enjoy the new optimized mobile website but as always, we would love to hear your thoughts. 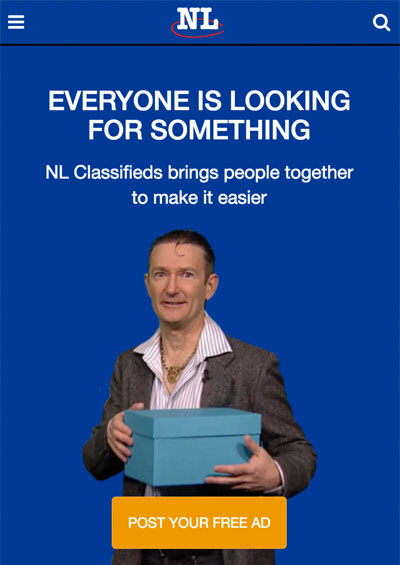 Comments, suggestions, issues or concerns can be voiced over the phone at 709-237-7300 or by email at support@nlclassifieds.com at anytime.